Tug, fetch, and chew! This toy claims to be good for all three. The Play Place Lattice Ball, made by JW Pet, is certainly an interesting looking toy. 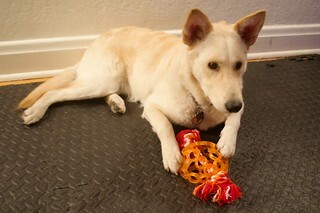 It’s not quite a ball and it’s not quite a rope, but we figured that Balki would know what to do with it anyway. It is made from "Super-Tough Megalastomer". What is Megalastomer, you ask? It’s just JW’s fancy word for rubbery plastic. It is actually a very common material that has many applications, but I’ll happily note that it is at least non-toxic. Balki was very wide-eyed when we took this toy out of it’s packaging. He was eager to try it out. Sadly, it was another short trial. Turns out that it wasn’t so super-tough. In just a few minutes, he had turned the Megalastomer into bright orange confetti and scattered it all over our floor. At least there was a little rope toy to salvage from the mess. Next!